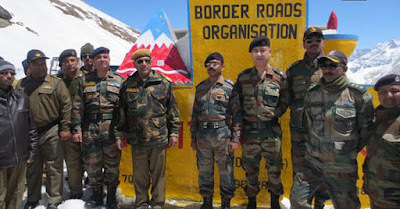 Border Roads Organisation (BRO) celebrated its 58th Raising Day on 7th May 2018. BRO is a leader in the field of infrastructure development in the border areas of India. BRO was established on 7th May 1960 and since then it has grown from two to nineteen projects. The works executed by the agency have ensured the territorial integrity and the socio-economic upliftment of the most inaccessible regions of India and its neighbourhood. On the occasion of the BRO Rising Day, Director General Border Roads Lt Gen Harpal Singh conveyed his best regards to all the veterans and BRO personnels. BRO functions under the Defence Ministry. It has its headquarters in New Delhi. BRO develops and maintains road networks in India's border areas and friendly neighbouring countries. In order to ensure coordination and execution of the projects handled by BRO, the Government of India set up the Border Roads Development Board (BRDB). The BRDB has the Prime Minister as its Chairman whereas the Defence Minister as its Deputy Chairman. Question 1. What is the full form of BRO? Question 2.Who is the Chairman of the BRO? Question 3. Which Ministry controls the Border Roads Organization? Question 4. When was BRO established? Question 5. Who is the current Director General of the BRO?